If you’re on a budget, grocery shopping is one of the chores that you need to master and be smart about. It’s a significant expense in every household that eats up a big chunk from your monthly budget. If the idea of grocery shopping already excites you, congratulations because you are now officially a responsible adult. But don’t let the excitement get to you or you’ll end up overspending at the grocery store! I, myself, am guilty of that. Thanks, to unnecessary purchases that aren’t even on my grocery list, I always end up getting the surprise of my life at the checkout counter. But somehow, I’ve already learned from my mistakes. So let me share with you 6 grocery shopping tips to save you money and avoid overspending. 1. Plan your meals/snacks ahead of time. Having your meals planned beforehand will prevent you from buying unnecessary food items that you already have or don’t really need. Check your fridge and pantry to use up what you have before buying more. I repeat – MAKE. A. LIST. Shopping without a “goal” is a disaster. You’ll end up noticing and buying all sorts of items that you think you need, but really don’t. 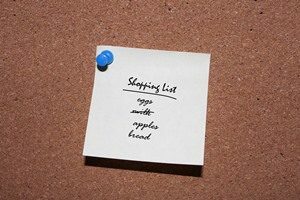 So before you step out of your house, make a list of the food items that you need based on what you have planned and stick with it. 3. Shop on a full stomach. I’m sure you’ve heard this advice a number of times already, but I am saying it again. Satisfy your hunger before stepping inside the grocery store. Otherwise, you’ll be tempted to give in to the mouthwatering snacks and treats that aren’t just unhealthy but will cost you more as well. Don’t let hunger trick you to buying food that you wouldn’t normally buy. 4. Shop with a budget. Set a budget for your groceries and stick with it. As you walk around the grocery store, add things up as you put items inside your cart to make sure that you’re still within your limit. 5. Check the prices first and shop around for discounts before making your purchase. Look for good deals and check for coupons online, in magazines or in stores for items that you buy regularly. But at the same time, don’t fall for store marketing tactics. Some of these strategies are made to blindside consumers and make them buy more even when they don’t really that much. If you fall for that, you’ll end up paying and wasting more money. 6. Don’t forget to check your receipt. Statistics show that the error rate in the accuracy of scanned prices is more than 4%. So make it a habit to check your receipt to make sure that there are no errors or discrepancies on your purchases.